A High court in London has awarded former Delta state governor, James Ibori, a nominal £1 (about N400) as damages over his claim of unlawful detention by British Home Secretary Amber Rudd. Mrs Justice Cheema-Grubb agreed that Ibori, who spent years in UK jail for money laundering, was unlawfully held for one day, 18 hours and 10 minutes between December 20 and 21 last year. She however ruled, in a way that mocked Ibori’s claim, that he is only entitled to a nominal £1 of the sum. Ibori had claimed £4,000 in damages. She said the Home Secretary “failed to have regard to her limits to detain” as attempts were made to claw back millions from the fraudster. Ibori was extradited to the UK for trial in February 2012 and prosecuted on the basis of evidence from the Metropolitan Police. He pleaded guilty to 10 serious criminal charges over the appropriation of massive amounts of public funds during his two terms as governor of Delta State, Nigeria. He was sentenced in April 2012 at Southwark Crown Court to 13 years imprisonment, and an order for his deportation as a foreign criminal was made in May 2015. Having spent time in custody in the United Arab Emirates, he was due to be conditionally released from prison on December 20 2016. But the Home Office indicated that there was no intention to deport Ibori to Nigeria until he handed over at least £57m “proceeds of crime”. An email stated: “we cannot deport Mr Ibori until the confiscation matter has been resolved”. On December 21 last year, the day after his due release date, High Court Mrs Justice May ordered Ibori to be freed on conditions, describing the attempts to detain as “quite extraordinary”. A Home Office application that Ibori be electronically tagged and subject to strict curfew conditions was also rejected after the judge accepted arguments that the Home Secretary was attempting to misuse her immigration and deportation powers. Ibori left the UK under his own steam on February 3 2017, but also launched his claim for damages for false imprisonment and breach of his rights under the 1998 Human Rights Act not to be unlawfully detained. 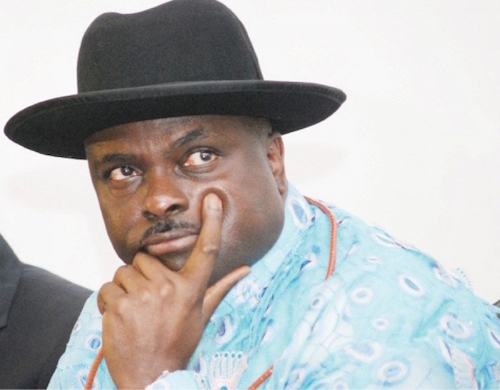 Ruling on Monday that Ibori had been held unlawfully for almost two days, Mrs Justice Cheema-Grubb said it followed a failure to hold effective confiscation proceedings. It was in the context of awaiting the making of an assets confiscation order, and likely subsequent efforts to “recoup” a sum estimated to be at least £57m, that the decision to detain Ibori was made. Ibori, a former London DIY store cashier, was jailed for fraud totalling nearly £50m in April 2012. He evaded capture in Nigeria after a mob of supporters attacked police, but was arrested in Dubai in 2010 and extradited to the UK.